We are in the final phase to prepare the customer driven update roll-out that will allow you to schedule the update of an instance to Dynamics 365, version 9.0. The current target to make update scheduling available is January 2018, and the window for processing the scheduled updates begins in February 2018 and ends in August 2018. Dynamics 365 administrators will be notified via the O365 Message Center and will receive an email when the update scheduling window opens. 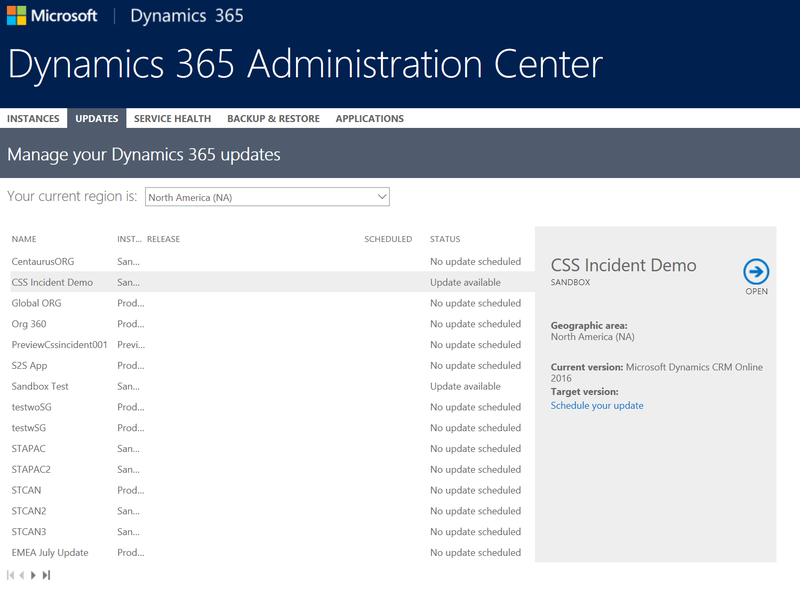 To see the update availability, navigate to the UPDATES tab on your Dynamics 365 Administration Center. Instances that are eligible for upgrade will have a Status of ‘Update available’. You can schedule your update and book your preferred and alternate dates. You can upgrade to version 9.0 from version Dynamics 2016 (8.0), Dynamics 2016 UPD1 (8.1) or Dynamics 365 (8.2). More information: Manage Updates. Note: The update availability to Dynamics 365, version 9.0 for Dynamics 365 Government and Dynamics 365 Germany is not part of this announcement. The availability of version 9.0 for these customers will be announced at a later date.